are available from places such as Maplin. These keep cables in place (in bunches), but they can not be removed and put back on. Once in place they have to be cut off to be untied. Velcro cable ties are also available from Maplin, They are easy to take off and put back on and they're supplied in several colours for the uber-nerds among us who think it's worth colour coding such things (ok, I admit it, I use red ones for the cables that are supposed to be in my bag, available on any client visit). Bluetooth and radio connections instead of cables – wireless mice (mouses?) and keyboards now work well, although I still have problems with some bluetooth-connected devices (except on my Mac, where they work perfectly for both keyboard and mouse). You can also now buy bluetooth-connected speakers, but I understand that the quality of the output may not match cabled speakers. Wireless printers. These are now easier to set up and keep working than when they first came out a few years ago, but they can still be tricky. They only save one cable, but that can be useful as it’s the data cable to the computer. If the computer is a laptop, it can be easier to carry around if it is connected to a wireless printer rather than a wired one. Accepting that most of our cables are here to stay for now, what can we do to tame them? Have plenty of socket extension boards so that plugs aren’t constantly being connected and dis-connected to make way for each other. It is almost magical how cables wrap themselves around each other under the desk, but the process is definitely exacerbated by constant plugging and unplugging. Buy enough extension boards for all the devices so that the plugs (and cables) stay put. Restrain the extension boards from moving around. I have screwed several extension boards to the modesty panel beneath my desk and this undoubtedly helps. When buying a new computer desk, consider one that has holes in the desk to allow cables to pass through. Some desks even have channels built into them that can take not only the cables but even extension boards as well. 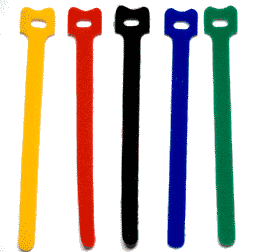 Plastic cable ties are available from places such as Maplin. These keep cables in place (in bunches), but they can not be removed and put back on. Once in place they have to be cut off to be untied. Velcro cable ties are also available from Maplin, They are easy to take off and put back on and they’re supplied in several colours for the uber-nerds among us who think it’s worth colour coding such things (ok, I admit it, I use red ones for the cables that are supposed to be in my bag, available on any client visit). Plastic spiral tubes that hold lots of cables in one bunch are a no-no as far as I am concerned. They may keep cables tidier than they would otherwise be, but they are a real pain to get off and on whenever you want to remove or re-locate a cable. They are fine for situations where you don’t think you’ll need to disturb the arrangement, but otherwise they are more trouble than they are worth. I suspect, though, that there may be a quicker way than I have ever found for deploying and removing these things. Answers on a postcard, please, or, better still, a comment on this blog. On a slightly different note, but while we’re crawling about in the dust under the desk, it’s well worth putting a simple label on each plug describing what it is connected to. I know this sounds really nerdy, but it can save a lot of time when adding or removing devices, and when trying to tidy things up. While we’re still underneath the desk, if your computer is a desktop one that is mis-named because you keep it on the floor, then be aware that it is even more prone to dust-collecting than a laptop or “actually-on-the-desktop”. Even if you don’t fancy taking off the cover to ensure that the dust is not collecting badly inside, do make sure that the air vents on the cover are cleaned from time to time. Vacuum cleaners are not thought to be a brilliant solution for this as they can create static electricity, but an air duster (can of compressed air) or one inch paintbrush can do the job in seconds. And, finally, please mind your head when coming out from under the desk. Or is it just me that mis-judges where the edge of the desktop is?